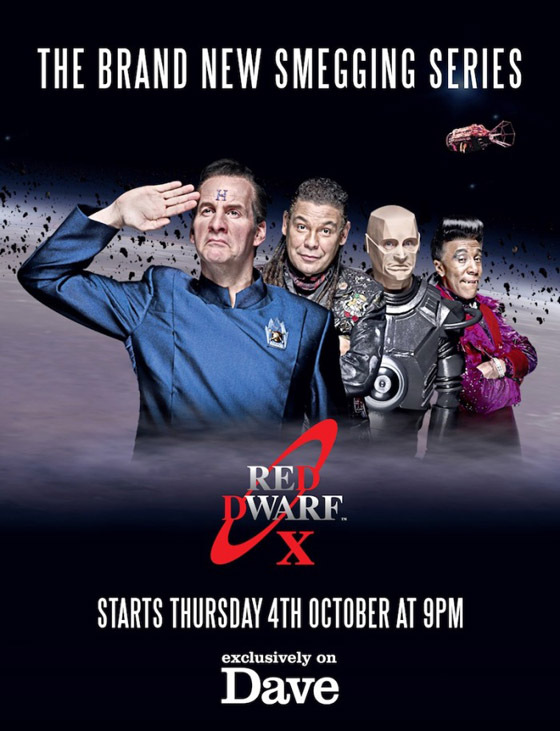 Irreverent and utterly brilliant English Sci-fi comedy, Red Dwarf, will return to British televisions on October 4th. Series ten will run for six episodes and reunites the original cast, sans the ever-unpopular Kochanski. The series will be premiering on Dave, which is a television channel by the way, but word has it'll be airing on PBS in the States the same day, though that's yet to be confirmed. The series was announced in April of last year, and principle filming began in December. A trailer for the new series is available on Dave's website. The poster itself looks exactly how a Red Dwarf poster should look: slightly cheap and just a little bit naff. The cast themselves are looking a little worse for wear - Craig Charles' lined jowls aren't exactly a testament to the rejuvenating properties of crack cocaine - but it has been nearly a quarter of a century since the show first aired. According to those who've seen the show's scripts, Series Ten closely resembles the first few seasons of the show in their focus on isolation, absurdity and often surprisingly "hard Sci-fi" concepts. You may now begin the traditional "it is/isn't better than Doctor Who" arguments.